Available on The Information and 2 other releases. Did you think that you were lucky? "Strange Apparition" can be found on Beck's 2006 album, The Information. More than a few reviews made this comparison, and I fully agree: the music sounds like the Rolling Stones, one of Beck's favorite bands. The tempo, the piano, the acoustic guitar all make an almost rollicking rock song, much like a Stones' track. Beck described it similarly, saying he "wanted it to sound like when The Beatles get out all their percussion and go bananas." The ending of the song, with it's sudden slow-down, is an expert turn too, the sort of thing The Beatles or Stones would do. Here Beck hints at ideas more than describing them ("all the riches and the ruins / we all know how that story ends"). But it still remains an evocative song. The first verse and chorus show a man who has had some success, but fears losing it (he's on the "last legs of [the] dream" that got him there). What will remain of this crash? Just a "strange apparition," a ghost of a human. Success is fickle, material items (such as the Mercedes-Benz, calling back to Janis Joplin) can come and go. What do you really have? This could be seen as a midlife crisis song, being haunted by ideas of "what remains?" after a life of success is removed. After the second chorus, the song slows down drastically and dramatically, mirroring fear of the crash and devastation narrated in the lyrics. Beck asks others who are crashing from a high point (analogized to a shipwreck): did you think that you were lucky (to have that success)? Well, maybe being stripped of the success is the real luck, when you can realize your real self, reaching a point when "anything can make you happy / nothing can make you scared." Beck wrote that in the early '90s, no less. Earlier in the song, he writes "from these shores where we belong / when the Lord is strange and strong / I have seen the land beyond." 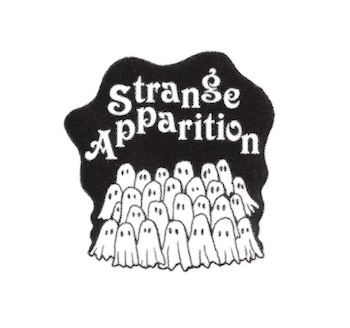 While that song is clearly a gospel sort of lyric; it does seem to tie in with "Strange Apparation" a bit. Both contain ideas of being haunted by your mind, the spirit coming up to you, and imagining a future existence (albeit the afterlife instead of just a post-success crash). I would not be surprised if Beck used a similar inspiration for both songs, though 10-15 years apart. Beck has not played "Strange Apparition" live very many times. There were just three live versions in 2006, when he was supporting The Information. And two of those were media shows (one on KCRW, one a Canadian acoustic set for television). The third was at an entirely acoustic show: it was sort of a sideshow, not a normal tour set (October 22 2006). Then in fall of 2012, Beck went to Australia for a couple weeks and played some shows. They added "Strange Apparition" to the proper set for the first time, doing it four times. A few weeks later, Beck did a benefit concert in Los Angeles and his short set began with "Strange Apparition." In May 2013, Beck did a quick 'acoustic' show to promote Song Reader and warm-up some Morning Phase songs (which he was likely in the middle of recording). "Strange Apparition" made one last quick appearance in that set, and then never showed up on the Morning Phase tours of 2013-2015.